Would you love to enjoy an early morning cup of tea or coffee, but seem not always to have enough time to boil water? Well, your worries are over with the OXO On Cordless Glass Adjustable Temperature Electric Kettle. 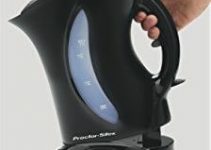 This is a great kettle that boils 1.75 L of water much faster than a stovetop or microwave and preserves the temperature of the boiled water at your preferred level for 30 minutes. It comes with a one-dial interface and back-lit screen which allows you to select your ideal temperature in Celsius or Fahrenheit quickly and instantly lets you know when it reaches your chosen temperature. The OXO On kettle is manufactured using hard-wearing BPA-free borosilicate glass for protection from thermal shock. The glass is also crystal clear so that users can easily discern the water level in the kettle. The non-slip handle of the Oxo Adjustable Temperature Kettle is comfortable and makes for a good grip while remaining unaffected by the boiled water within the kettle. This means you can carry the kettle comfortably without fear of being scorched. The kettle is cord-free which makes it very portable and comes with a 360-degree swivel base. Is also calibrated in milliliter and in ounces to make it easier for you to precisely measure the amount of water you want per time in the appliance. Also comes with a stainless steel filter that is perforated so that you can strain water when filling the kitchen appliance. The filter is not only reusable but removable as well for easy cleaning. The illuminated power switch of this appliance turns off automatically as soon as the water reaches a rolling boil. It is compact enough to be stored in your kitchen cabinet after wrapping it around with its cord. The stay-warm function at specific temperatures is a big plus in addition to the boil dry protection – just in case the stay-warm feature is still active, but the appliance itself is empty. The LED interface is user-friendly, and the display is concise and clear enough to discern. It is very fast in bringing as much as 16 ounces of water to a boil within 2 minutes. This is three times faster than any traditional boiling kettle. It gives suggestions of temperatures for specific drinks on the electric base, i.e. green tea should be heated to 175 degrees, etc. Its calibrated marking make it easy for users to quickly determine whether or not they want to refill the kettle. It features an auto-shut off for safety. It is not easy to clean due to the small opening at the top. It is practically impossible to empty all the water from the kettle vessel. The customer reviews about the OXO On Kettle is friendly and other than a few complaints here and there about the design quality; this kitchen appliance delivers on its promise. With his beautiful glass body that is simple yet elegant and a feature that gives you control over the temperature you love when it comes to enjoying your favorite beverage, you will find this tool a real help in the kitchen.